Check out the new RVA Weekly site! 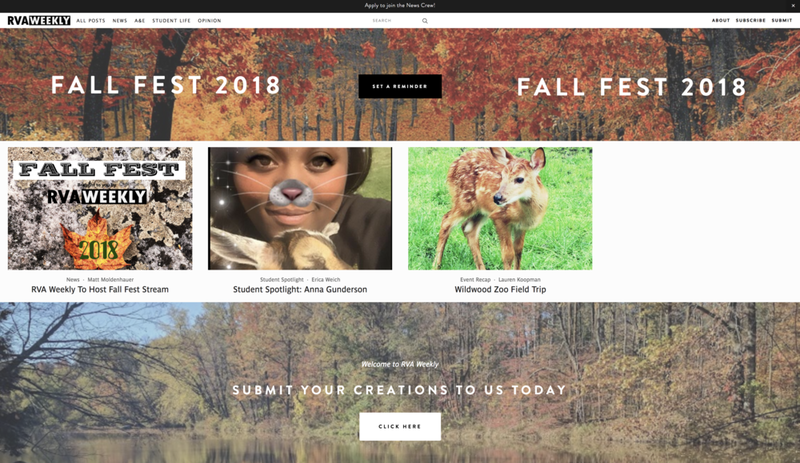 The purpose of the RVA Weekly is to create a positive school climate and foster a sense of community in the RVA by showcasing student work, created for school related assignments or simply just for fun. Besides benefitting the RVA community, we feel the RVA Weekly will give students a platform to express themselves and share one of the many talents found throughout the RVA student body. Please explore the RVA Weekly site to learn about its contents, and consider submitting your work. Let us take advantage of this opportunity to have some fun, while highlighting the many talents found among the RVA students! Visit The RVA Weekly Now! From chaotic life to sharing the best of each day!